Benefiting from a superb location on the south coast of Iceland, the convenient Hotel Edda Vik i Myrdal with a 9-hole golf course is a comfortable accommodation in Vik i Mydral, not far from the stunning Myrdalsjokull glacier and the small peninsula of Dyrholaey. 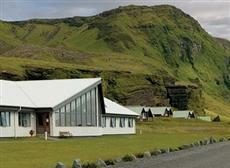 This welcoming hotel offers modern standards of comfort and amenities, allowing for a great vacation on Iceland. A remarkable nearby feature is the famous and beautiful black beach of Reynisdrangar with the black basalt columns sculpted by the sea. A famous Iceland folk tale says that they are former trolls which were caught outside at dawn. This charming best price hotel is also an ideal accommodation solution to enjoy many outdoor activities in the nature such as golfing, horse riding, hiking, climbing or bicycling. With a cosy sea-view Restaurant, a private parking area, and a very helpful staff, the welcoming Hotel Edda Vik i Myrdal in Vik i Myrdal represents the perfect destination for guests looking for an unforgettable stay on Iceland.